Ark Country Store now carries Victor Dog Food and Cat Food! 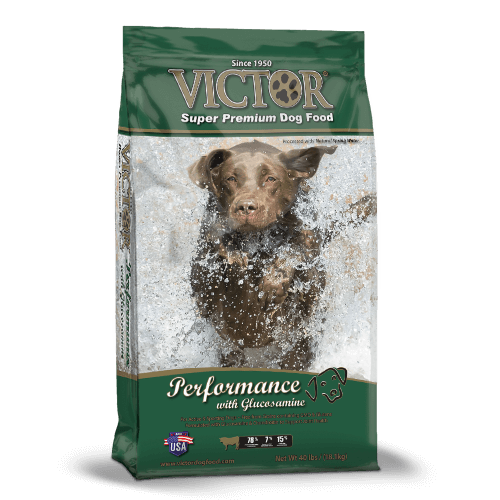 Victor Premium Quality Dog food is formulated using multiple proteins that include USA sourced Beef, Chicken and Pork (Meals). Dog owners choose to use the 4 product All Life Stages Formulas(Ocean Fish, Lamb, Chicken, Beef) to change the flavors for their dog throughout the year. The Professional line, like all super premium Victor formulas, contains no Corn, Wheat, Soy or Gluten and is free from less digestible processed grain by-products. The result is a highly digestible food that will require less food intake to meet energy demands and yield minimal stool volume. Multiple scientifically advanced ingredients are included in the formula that works together to support excellent digestive and immune system health. Any Victor Pet Food formula is an excellent choice for dogs of All Life Stages. Also check out the Victor Cat Food selection below, under Feline. Victor Super Premium pet food is manufactured by Mid America Pet Food, a family owned business, located right here in Texas. Have any questions about Victor Dog or cat food? Stop in and talk to our experts about which Victor blend is right for your pet. We carry Victor Dog and Cat Food at both our locations. We hope to see you soon! This entry was posted on Thursday, December 28th, 2017 at 10:52 am	and is filed under News & Updates. You can follow any responses to this entry through the RSS 2.0 feed. Both comments and pings are currently closed.